Windows 10 / Server 2016 requires at least a KMS server based on Windows Server 2012. 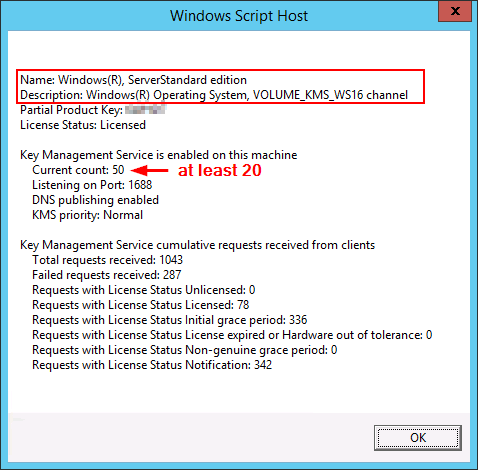 Activation via Windows Server 2008 R2 is not possible! 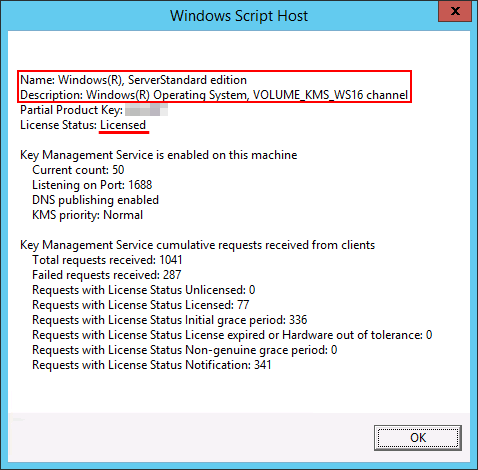 For Windows 10 LTSB 1607 the Licence key “Windows Server 2016 Datacenter” is valid. Display the installation ID that is necessary for telephone activation. 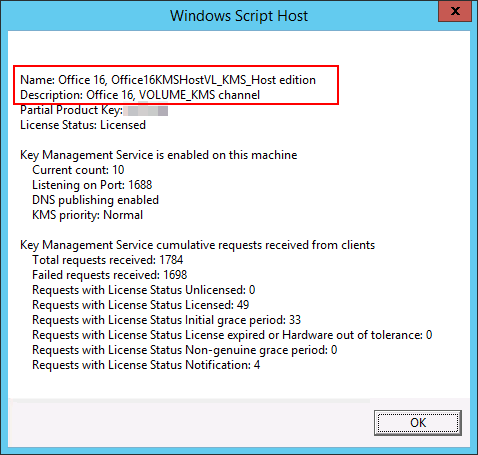 Activate your KMS key by calling Microsoft hotline for product actiavtion and enter your “Instllation ID” by telephone. You will receive a “Confirmation ID” that must be entered by the following command. C:\Windows\System32>cscript slmgr.vbs /atp 344813441331539443010980848521935031229423670225 Microsoft (R) Windows Script Host Version 5.8 Copyright (C) Microsoft Corporation. All rights reserved. Confirmation ID for product 7b37c913-252b-46be-ad80-b2b5ceade8af deposited successfully. If the activation ID isn’t accepted you will receive the error 0xC004F04D. Retry the phone activation in most cases you just entered a wrong installation ID. Sometimes the hotline is telling you a wrong “Confirmation ID” or answers you in languages you have never heard about. I had that problems several times… Your only chane is to open a MS ticket to solve the problem. I’ve tried to solve problems like these with the activiation hotline but most of the guys are not familiar with the Windows activation. You are done with the Windows 10 / Server 2016 Key integration. Display the installation ID that is necessary for telephone activation. You have to add “98EBFE73-2084-4C97-932C-C0CD1643BEA7” to receive the Office 2016 installation id otherwise you will receive the installation ID for Windows Server 2016 / Windows 10. 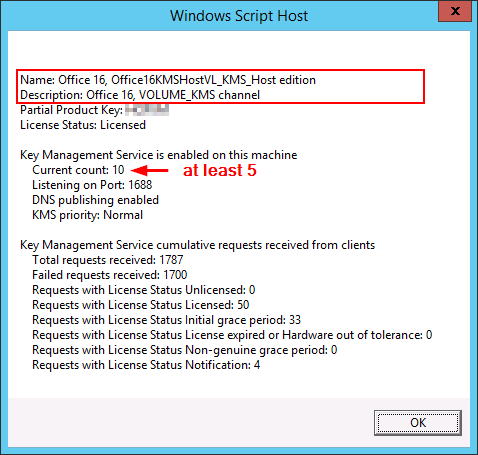 Activate your KMS key by calling Microsoft hotline for product actiavtion and enter your “Instllation ID” by telephone. You will receive a “Confirmation ID” that must be entered by the following command. You have to add ” 98EBFE73-2084-4C97-932C-C0CD1643BEA7” for Office 2016 activation otherwise you’ll try to activate Windows Server 2016 / Windows 10 with an Office “Confirmation ID”. C:\Windows\System32>cscript slmgr.vbs /atp 344813441331539443010980848521935031229423670225 98EBFE73-2084-4C97-932C-C0CD1643BEA7 Microsoft (R) Windows Script Host Version 5.8 Copyright (C) Microsoft Corporation. All rights reserved. Confirmation ID for product 98EBFE73-2084-4C97-932C-C0CD1643BEA7 deposited successfully. You are done with the Office 2016 Key integration. There are also ways to configure a static entry in your Windows 10 OS deployment or Office 2016 deployment. But when your environment receives a change for example the hostname of your KMS or you have to replace your KMS server by another one you will get in trouble fixing all that static links. I’ve seen a lot of customers setting up static links to the KMS server which was easy to configure for the project first, but for the operations team it was a mess. In most companies the DNS record will be created by the “Network Team”. So how can we ensure that these guys have done their work? Just type the following command on any Windows 10 client that is member of your domain. As you can see in this example there are two KMS servers available. Error: 0xC004F015 On a computer running Microsoft Windows non-core edition, run 'slui.exe 0x2a 0xC004F015' to display the error text. If you receive the error 0xC004F015 your entered key is invalid and can not be used by the KMS server. Check if all neccessarry updates were installed! 0xc004f038: The Software Licensing Service reported that the computer could not be activated. The count reported by your Key Management Service (KMS) is insufficient.